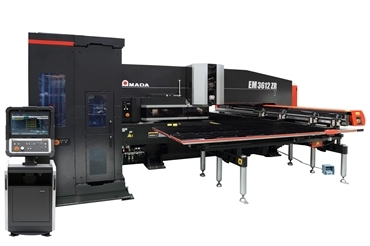 The next generation of the cutting edge EM Series turret punch press with 300 station tool storage unit and high speed automatic tool changing. Utilising power saving electric servo drives, this innovative machine combines high speed production, impressive reliability and numerous cost and process improvements. Additional productivity enhancing features include scratch free processing with a concealed lower turret, ID Tooling system for digital tool control and a range of automated sheet load/unload options.